George Booth escorted the tour from Australia. 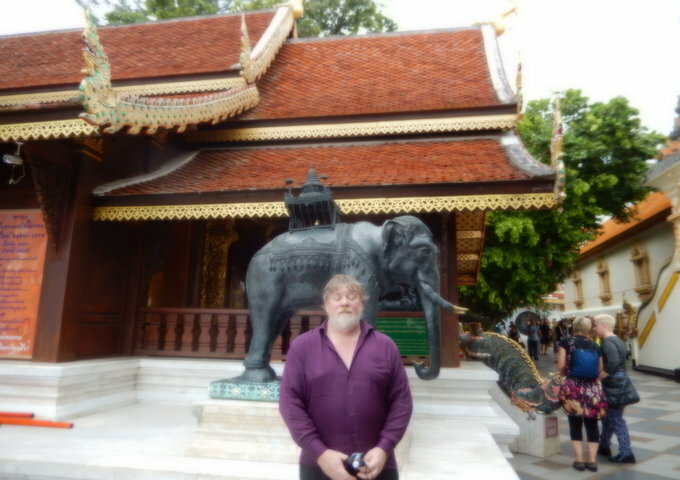 He has travelled extensively and escorted vision impaired tours to Singapore, North Borneo, Hong Kong and recently China. 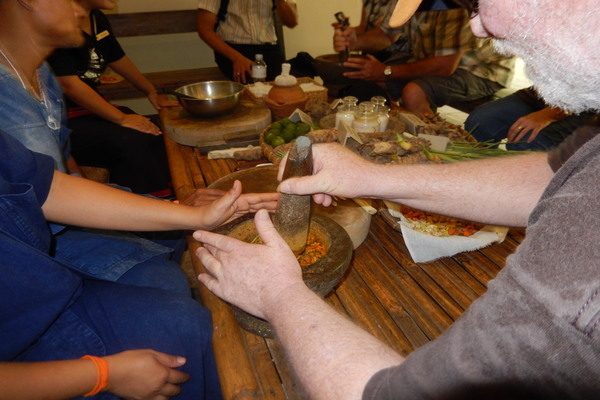 His experience in this specialised field ensures that expectation is met, and care taken, to provide the essential tour content, enabling participants to enjoy the best of the destination. Experience the rich exotic incense and jasmine smells, tinkling bells in the temples from the many rooves at Wat Phra Geow at the Grand Palace, the roar of the long tail boat engines, the clammy feel of the moist warm air, unmistakable putt-putt of the tuk tuks, with the vibrant and tantalising tastes of the Thai food with its combination of sweet, sour, spicy and salty. You will hear the distinctive sounds of Thai music with its drums, bells and special stringed instruments together with the colour and movement of the dancers. 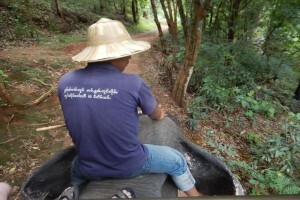 Be touched by the profound gentleness of the people as they welcome you on this wonderful journey to Amazing Thailand. We had the afternoon exploring the hotel and visiting the MBK shopping complex ajoining the hotel where we were able to get Thai currentcy(30 Thai Bart for 1 aussie dollar). 8:00am the coach departed for Bangkok National Museum. 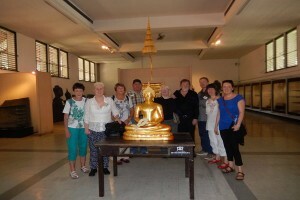 The Touching Thailand Programme has been developed by the National Museum Bangkok (NMB), the Thailand Association of the Blind (TAB) and some National Museum Volunteers. During our tour we had hands on Buddha statues, architectural items, ceramics and other pieces while we learnt about Thai art, history and culture through our fingers. 12:30pm we left the museum for our first authentic Thai lunch at the riverside restaurant, Supatra River House. 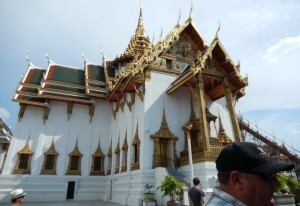 2:00pm After lunch, we took a short ride by Tuk Tuk to the Grand Palace, a “must see” in Bangkok. The Grand Palace complex includes the Temple of the Emerald Buddha (Wat Phra Keow). This superb statue of Buddha is carved from just one piece of jade. The Royal Funeral and Royal Coronation Halls are also there. 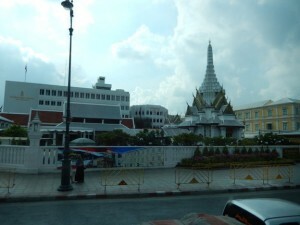 6:00pm the coach departed the hotel for Siam Niramit Dinner & Show. Siam Niramit is a world-class show held on, according to the Guinness Book of Records, the largest stage in the world.The show highlights Thailand’s historical and spiritual heritage, with more than 150 performers. 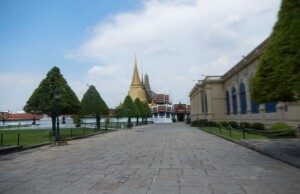 You can also visit replica villages in the theatre compound and buy Thai handicrafts from several stalls. 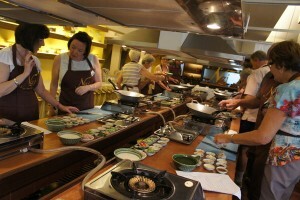 Thai food is one of the most recognised styles in the world. We Learnt the traditional way of preparing a meal by using pestle and mortar. We also learnt and, of course, tasted how to make Thai herbal juice from lemongrass, Butterfly Pea flower, Pandanus Tea and the like. The Chef was more than happy to explain the benefits of these herbal juices. We had a fantastic time cooking up a storm with guidance from our Thai chef. It was great to learn the how the different spices infused with each dish and the taste sensation they produced. 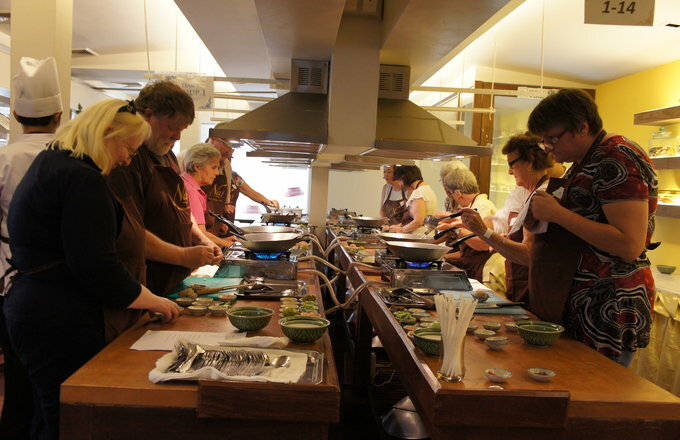 Learning the Thai cooking style of wok cooking was was a real experience. 12:00-1:00pm Today’s lunch was from our own cooking; and it was Enjoyable! 1:30pm After cooking up a storm, we relaxed for an hour of massage. We were taken to a special massage place at the Foundation for the Employment Promotion of the Blind. Blind masseuses used their massage skills for our relaxation. 6:00pm The coach departed to Anantara Boat Pier for a dinner cruise on a traditional boat. Manohra Cruises offers fine Thai dining while cruising along the Chao Phraya River on a restored wooden rice barge. The cruise offerd three unforgettable hours of fine cuisine and culture while admiring the sights. 6:30am An early breakfast today. We Departed for the floating market and Sampran Riverside for a glimpse of everyday life. A ride on a Thai paddle Boat through the marshes and stilt houses prepared us for this unique market. 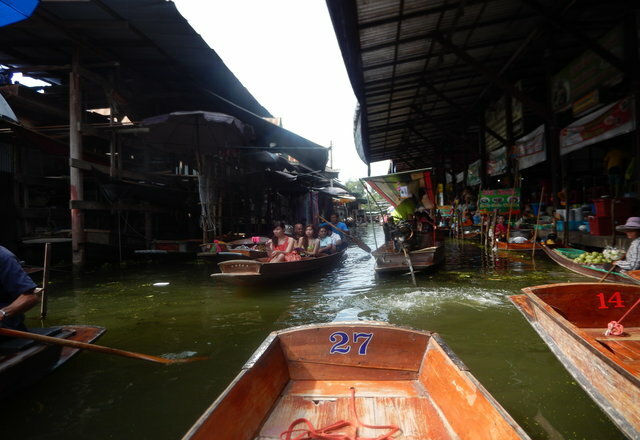 We continue our journey to Sampran Riverside – half an hour away from the floating market – for lunch. After lunch we were treated to a Thai Village show which included cultural activities, a wedding ceremony, Thai dancing, an elephant show and a whole host of other activities. 10:00am – The coach departed at 10am to meet our Thai Airways flight, departing at 1.05pm. 6:0Opm Khantoke Dinner with cultural show. At a Khantoke Dinner, the food was served on large platters at low tables while you sit on mats on the floor. Let yourself be entertained by some Nnrthern cultural performances, including a special hill tribe show performed by members of Yao, Lahu, Meo, Lisu, and Karen hill tribes. 8:00am Half Day with the Elephants. Nowadays elephants are only used as powerful beasts of burden, but in earlier times they were a vital part of the King’s army. 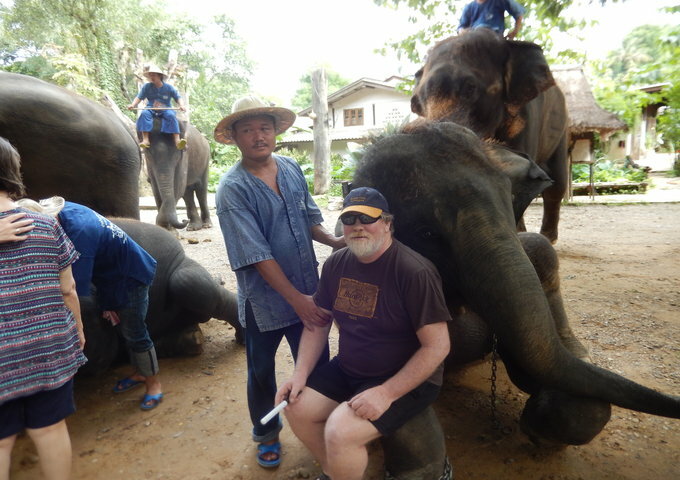 We traveled approximately 60 km north of Chiang Mai to the Elephant Camp, an unspoiled setting in which to marvel at these magnificent animals performing amazing feats of strength and skill at the command of their ‘mahouts’. You may try your skills and command the elephant yourself! Shower with the elephant if you wish! 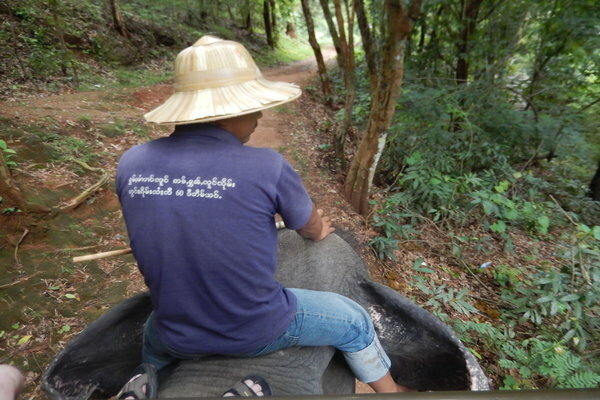 Then followed a heady elephant trek through the neighbouring jungle, past bamboo trees and hanging creepers, upwards towards a Lisu hill tribe village. 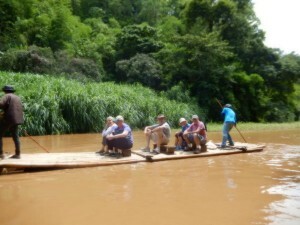 Local lunch was provided, after which it’s time for a relaxing bamboo raft trip along the river. On return to Chiang Mai, the journey continued by road to an orchid farm at Mae Sato where we admired some of these exquisite blooms. 7:00pm – a short trishaw ride to the Whole Earth restaurant for dinner. 8:30arn Chiang Mai Exploration Tour. 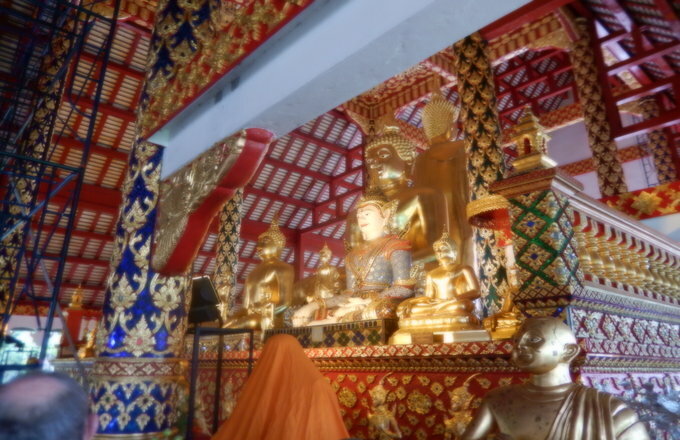 The city of Chiang Mai has many beautiful and historic Buddhist Wats (temples). We visited the wonderful 600-year-old temple of WAT PHRATHAT DOI SUTHEP. After a drive up the mountain’s winding road, the final climb to the site is via an enormous mythological Nagas (Dragon-headed serpent) staircase of 306 steps. 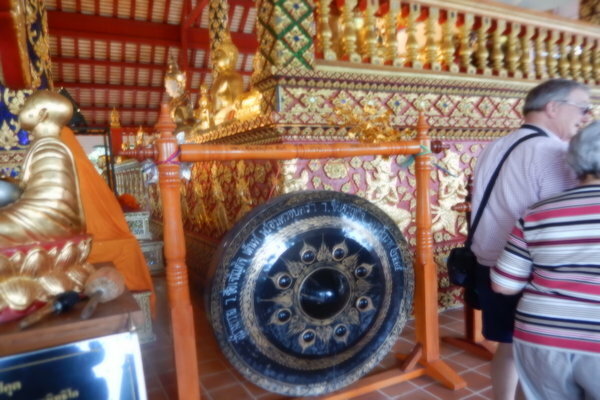 Inside the cloister is an intriguing copper-plated chedi topped by a five-tier gold parasol, which contains partial relics of Lord Buddha. On a clear day, there are incomparable views over the city of Chiang Mai from the temple grounds. Other temples visited include WAT SUAN DOK, whose stupa contains Buddha relics, and WAT CHEDI LUANG, which consists of an impressive chedi, originally built in 1411. On our way back from the temple we visited the Northern Blind School Chiang Mai. We Met vision-impaired students and participated in their daily activities . We had a day at leisure where we took the opportunity to have a fish foot treatment where little fish nibble away at your feet. Very relaxing, ticklish and enjoyable. 6:30pm Transfer to the airport for your flights home. Depart on Thai Airways flight departing at 8.50pm, arriving at 10:10pm. then we connected to our onward flight bak to Perth landing at 7.25am Sunday morning.